Offering an outdoor swimming pool, a garden and a terrace, Logis Hotel Prato Plage is located in Pernes-les-Fontaines. Free Wi-Fi access is available for guests. All double rooms feature views of the garden or the swimming pool and a TV, while some rooms also feature a terrace. The en suite bathroom is complete with shower, toilet, hairdryer and free toiletries. 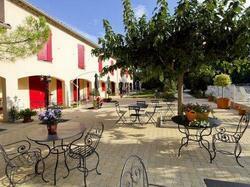 Logis Hotel Prato Plage has an on-site bar and a restaurant serving Provençale specialities and a breakfast buffet. The restaurant features views of the lake and of Mont Ventoux. Guests can enjoy the hotel's private lake with its beach, a petanque field on site and hiking paths in the surroundings. Mont Ventoux is 30 km away and Avignon is 24 km away. If you expect to arrive outside reception opening hours, please inform the property in advance. Contact details can be found on the booking confirmation. This double room features views of the garden or the swimming pool and a TV. The en suite bathroom is complete with shower, toilet, hairdryer and free toiletries.